The Detox Kitchen aims to take away the stress of planning, shopping and cooking healthy meals, with their team of experts creating nutrient rich, delicious and well-balanced food that can be delivered straight to your door. After selecting from a range of packages (Protein, Vegan, Green- to name a few), Detox Kitchen chefs then create your breakfast, lunch, dinner, juice and snacks using fresh and seasonal ingredients, which are then delivered to your home. Detox Kitchen also serve their fresh, bold and delicious dishes in various London delis, including Kingly Street, Fitzroy Place and Selfridges. With a salad and juice bar, eat-in menu and grab and go fridge, their focus is on good quality and whole ingredients to create the comfort of the a kitchen away from home. Dishes are free from wheat, dairy and refined sugar. 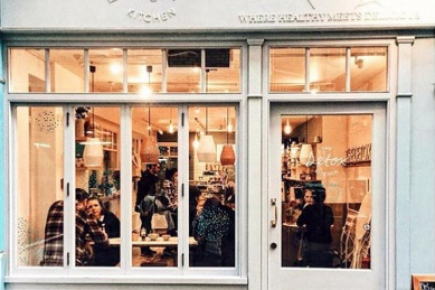 Flagship deli in Fitzrovia, London, is also home to Studio, a fitness studio providing a range of yoga, ballet and pilates led by expert instructors.